Today is part 3 of a 4 part list of comics that challenged me in 2017. Here’s a link to the first part of the list and here’s the link to the second. This part of the list has a few more books I’ve already reviewed, but part of the reason I reviewed them was because of my fascination with them and the challenge they gave me as a critic.Hope you enjoyed the first two installments! 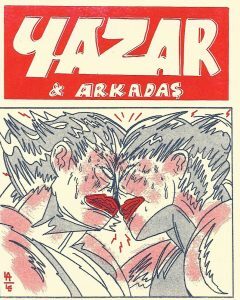 Yazar & Arkadaş was a book I reviewed early in the year in 2017, and I’m amazed at how its stuck with me. 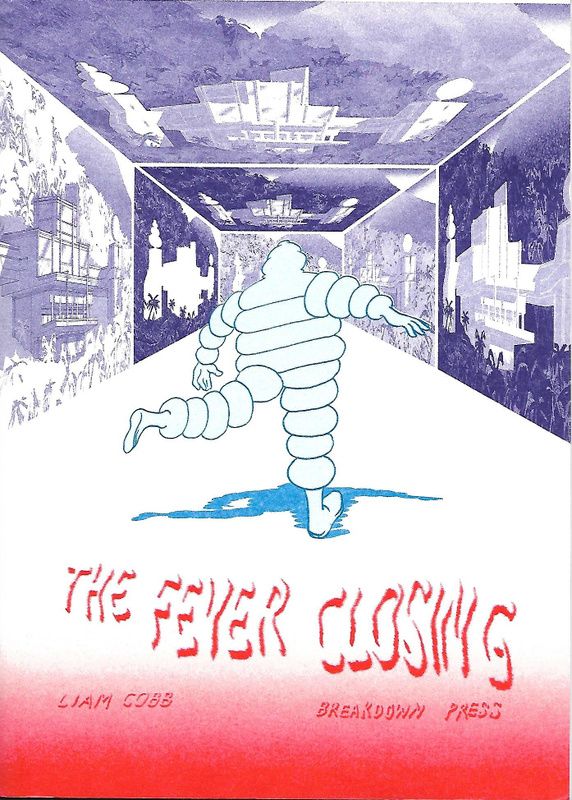 The physicality of Westvind’s work, the dense movement of it, and its raw esotericism made it an undeniable force. Its spiralling quality, and its frank sexual overtones, all of this left a mark on me this year. I’m surprised I haven’t seen more talk about it. Taylor’s comic from Breakdown Press was published in 2016, and I reviewed it early in January last year. 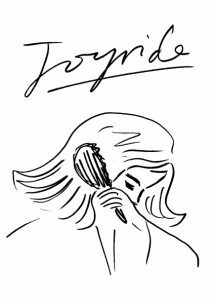 I was struck by how emotionally laden the comics were, how Joyride‘s simplicity belied its vibrant construction. Taylor’s focus on individual features in the images (eyelashes, etc.) as opposed to the overall construction gave the book a sense of purposeful abandon. I was fascinated by the way Taylor channeled emotion with this book and it was a surprise favorite in winter last year. En attendant t’avenue is the only book on this part of the list that I didn’t review this year, Henninger’s comic deconstructed the “book” in a very literal way by removing the cover. This decision means that it opens cleanly at the page fold, showing off the never ending construction of a long building. 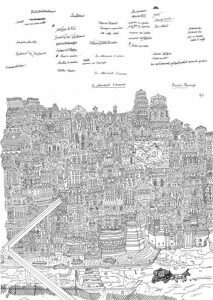 This comic was full of meticulous, claustrophobic detail, and its stream of consciousness construction and language as visual element were unique among comics I read this year. A fantastic addition to my growing collection of foreign language comics. 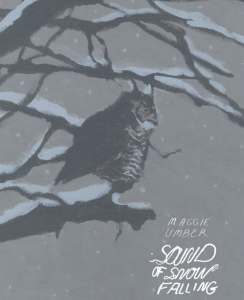 Maggie Umber’s Sound of Snow Falling is a beautiful book, there’s no doubt. But in depicting the life of two great horned owls, it also challenged my perspective of the ways we create narratives around animals and how we humanize them. This book was a challenge to documentary and other nature narratives that instinctively generate human voices for subjects that are too vicious, wild, and beautiful to be contained in something so simple. 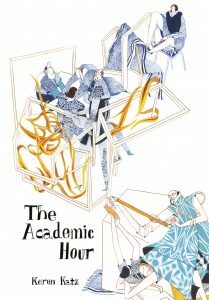 Likely one of the most confusing and most vibrant comics I’ve ever read, The Academic Hour is one of the books that gave me energy in the middle of 2017. Katz’s work is magnificent, the colors bold and unusual, and the intricacy of her illustration alongside the puzzling nature of her narrative made The Academic Hour one of my favorite reads of 2017, and also one of my most frustrating. The fourth and final part of the list goes up on Monday – see you around! If you like the Comics That Challenged Me feature at Sequential State, please consider becoming a Patreon subscriber to the site. Your subscription gets you access to more writing and potentially other cool stuff like zines or a monthly mini-comics mailer. Thanks!